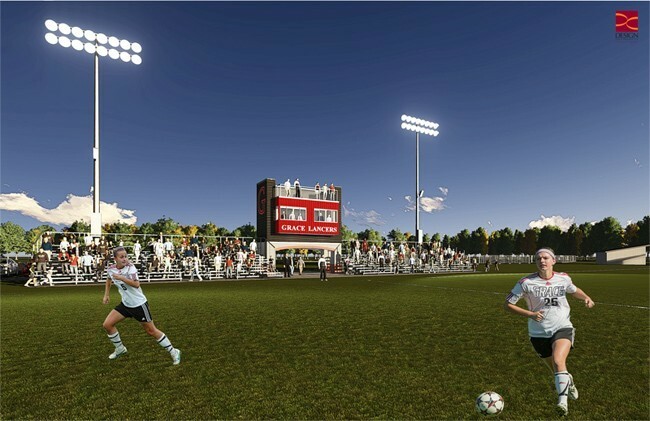 A comprehensive project this summer is set to revamp Miller Athletic Complex at Grace College, Winona Lake, Ind., transforming the soccer complex to install lights, bleachers, team bench areas, and a press box among other improvements. A donor has pledged $350,000 anonymously to fund the soccer field improvements. Construction will be ongoing throughout the spring and summer and is scheduled to be completed by the start of the fall 2014 soccer season. New lights installed at the soccer field will allow Grace men’s and women’s soccer games to be played at night for the first time. The teams will also enjoy upgraded team bench areas and a team meeting room at the field. The soccer field itself will undergo a makeover with the pitch to be widened. The soccer complex will add 1,000 new bleacher seats, meeting the capacity requirement to host NAIA Opening Round matches. Other upgrades to the soccer complex include a new scoreboard, fencing around the perimeter of the complex and a press box complete with wireless Internet to enable live video streaming of home matches. The groundbreaking ceremony, held at the soccer fields, took place on Friday.